After several successful tours to Romania over the recent years we’ll repeat our program from 2013 where we had occasional problems with the weather. Our itinerary is very dense and will offer virtually everything which can be seen in steam if you’re searching for high quality photography. We’ll cover most of the forestry lines and two other narrow gauge lines and run authentic looking trains on them. Until the early 1990s forestry lines were still common in Romania but, shortly after the political change, one after the other, the lines disappeared from the map. Of the last three remaining lines only one, Viseu de Sus, is still in use and nowadays it is operated by diesels. They have established a steam operated tourist service but the locomotives and the coaches are strangers to this line. The other two lines are closed, with only occasional charter trains running over the tracks. The Moldovita line was almost abandoned and the parallel gravel road was paved in recent years. Fortunately, they have now rebuilt a few miles of the line. In Covasna and Comandau, formerly connected by an inclined plane, there are still two short stretches of track. In Comandau I invested some money to allow them to rebuild a part of the line near the village. 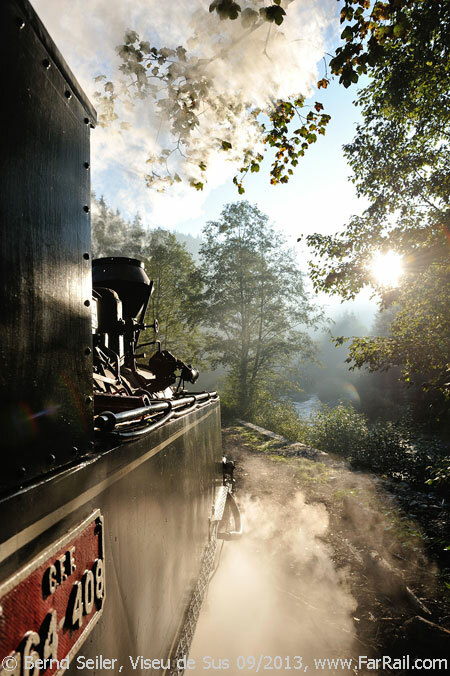 On all three lines, we’ll arrange authentic steam trains, turning back the clock on these fascinating railways. The best opportunities for good pictures and videos can be found on the 40-plus km long line of Viseu de Sus. The other lines are less than half as long as the water valley line from Viseu but still offer a good variety of opportunities and some very interesting situations for pictures. A feature of this trip will be a night in the mountains. We’ll visit a forestry log cabin and go to where they cut the timber. The logs will be brought to the railway by horses and probably loaded by hand. This is no longer the normal operation but it is how it was done decades ago. 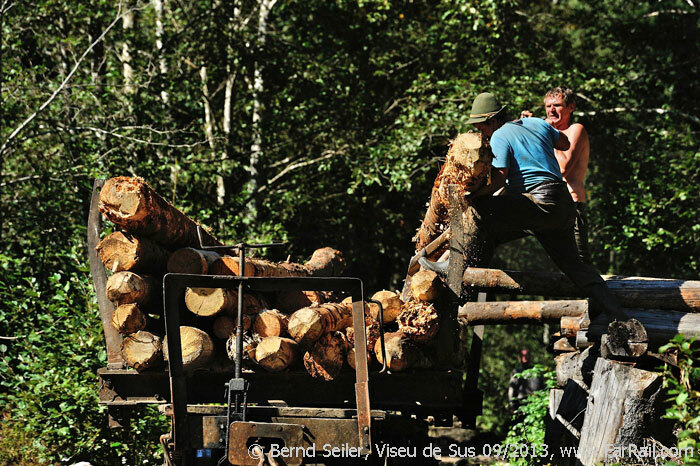 So our focus is not only on the line and the steam trains but also we’ll take videos and photographs of logging activities from the forest to the sawmill. The use of a particular steam locomotive cannot be guaranteed. We can count, however, on the talent and improvisation of the local crews and we hope to be able to use the equipment we want. We’ll see different types of locomotives in use. In Viseu we’ll use one of the almost “indestructible” Resita locomotives. For Comandau and Covasna we need to bring the locomotive of our choice to these lines on a low-loader truck. Along with the locomotive we’ll transfer three pairs of wagons to Covasna and Comandau to create an authentic looking train. 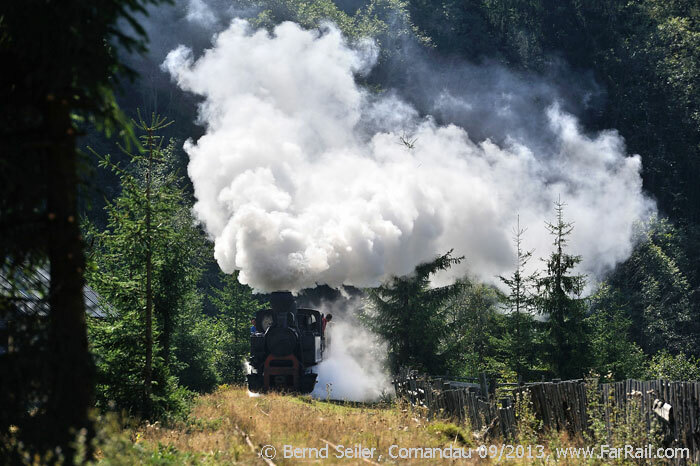 For Covasna and Comandau we chose the recently overhauled Budapest built 0-8-0 tank locomotive 764 243. We’ll not use fancy passenger coaches or open cars with seats on. We just can’t say for how long such events like this will be possible in the Romanian forest. We don’t even know whether we can execute all events as planned but we’ll do our best to bring all these ideas to fruition. A landslide, a flood or something like that could easily destroy major parts of a railway in the Carpathian valleys. That’s why absolutely nothing in this tour can be guaranteed. 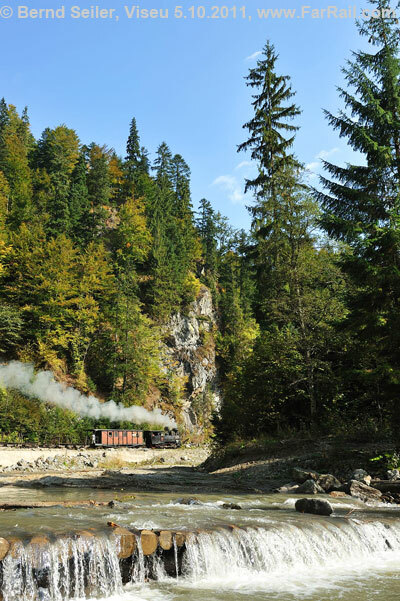 If you want to see these fascinating railways you should go there sooner rather than later. On recent tours it has always been worth taking the chance to be there and we’ve had good results. 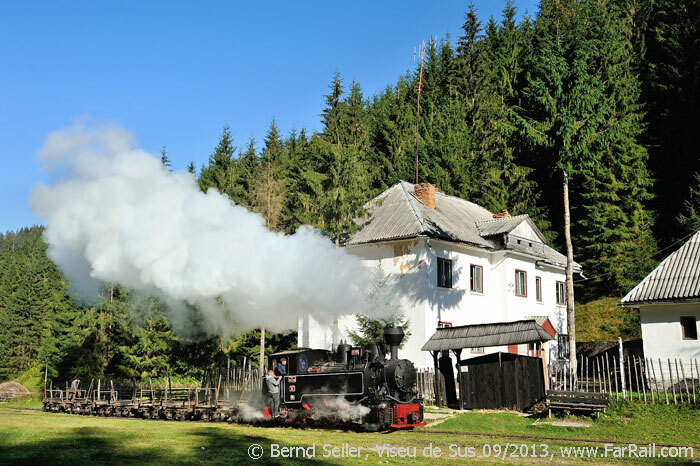 In addition to the forestry lines we’ve added the steam operated industrial narrow gauge line Brad  Criscior and a section of the former state railway operated narrow gauge line Turda  Abrud. In Brad we’ve chartered an authentic freight train with a Resita locomotive and about five freight cars, just as it used to be some 30 years ago. The few kilometre long line hasn’t seen many changes over the last decades. It’s an industrial line, completely different from the forestry lines. The Abrud line is surrounded by mountains and offers plenty of good opportunities. We’ll run an authentic short mixed train here. In the early morning (ca. 6.30 hrs) we’ll steam uphill into the mountains. Today is Sunday, so we don’t need to worry about regular trains and have all the time we need for many photo stops and runpasts. Our train consists of a Resita locomotive (hopefully 764 469, an original loco from Viseu), a special tender, passenger coach and several empty trucks, just as the normal train used to be many years ago. Accommodation in a basic guesthouse in the mountains above Faina. 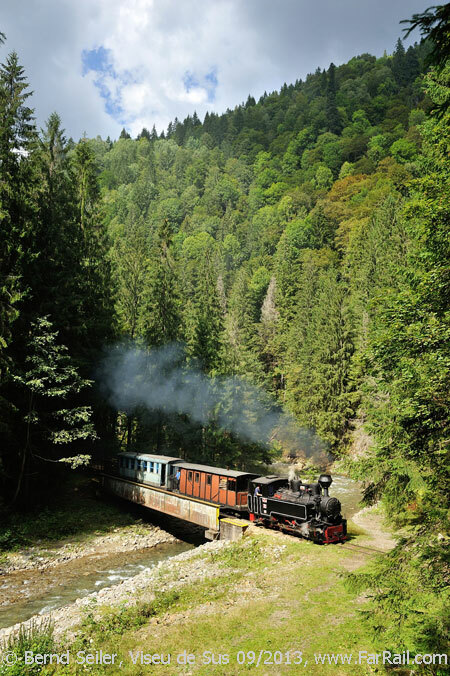 We’ll follow the regular diesel trains with a steam hauled train into the mountains. We’ll go to Cozia, maybe only to Delta Novat to be back in Viseu de Sus in time. Today we need to work around all the scheduled diesel trains and railcars and adjust our running times around them. However, some good pictures will be possible as the train stops several times on the way where we can get off and walk a bit forward and wait for the train at a good position. We’ll probably use the Orenstein & Koppel locomotive 764 211. In the late afternoon we’ll go by charter bus to Moldovita. Accommodation in Moldovita. In the morning we’ll run a charter train on the rebuilt line as far as possible. We’re using logging trucks and a van. We tried to use the Kraus loco 763 193 which ran here for decades. However, because of political difficulties it’s not possible to bring this locomotive to Moldovita, that’s why we’ll use a Resita loco. Afternoon/evening charter bus transfer to Covasna. Accommodation in Covasna or Comandau. Early in the morning we’ll go by charter bus up to Comandau, probably with mini buses to manage the adventurous serpentines. In Comandau a real forest train is waiting for us. Hauled by a Budapest-built locomotive we’ll go with empty trucks (locomotive and trucks brought to here by low loader on the road) into the deep forest. At a suitable place we’ll load these trucks with logs using a TAF forestry machine. The logs will be brought to the loading place by truck (all chartered: truck, logs, TAF, train) The loading process will represent the authentic way they did it (and still do it) when machinery was used. We’ll enjoy a picnic in the forest and wait for the better afternoon light. 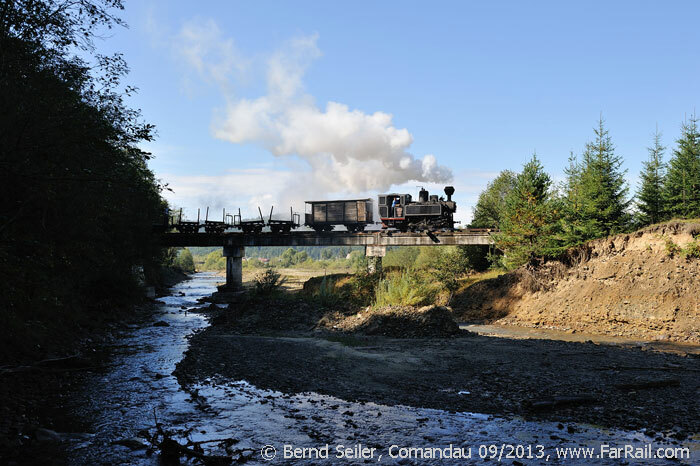 In the afternoon we’ll return with a loaded logging train to Comandau. Accommodation in Covasna or Comandau. 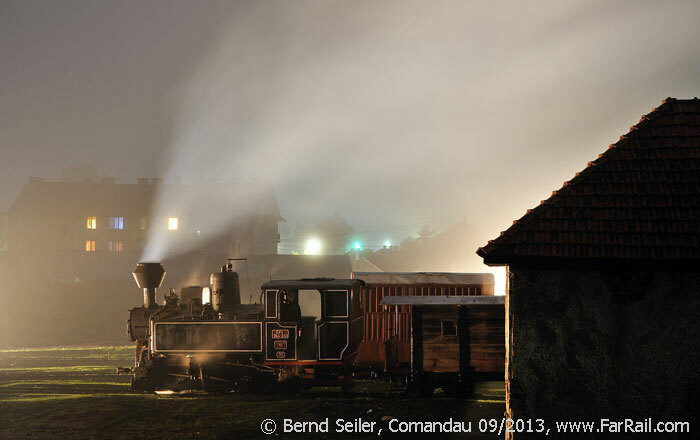 Overnight we’ll have brought the Budapest loco and the trucks down to Covasna by road. Our little train will run a very few miles on the “flat” stretch of the railway. Around 10.30 hrs we’ll continue by our charter bus to Brad. 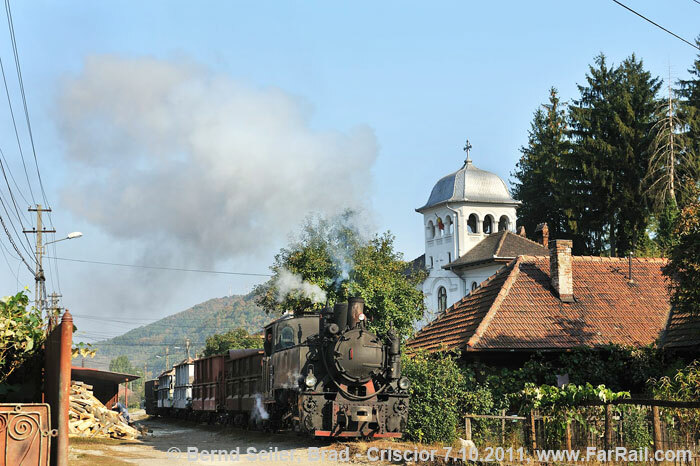 If our times permit we’ll stop in Sibiu and visit the local railway museum there. Motel in Brad. In the morning we’ll take a Resita locomotive and about five freight cars from the state railway station in Brad to a factory in Criscior. 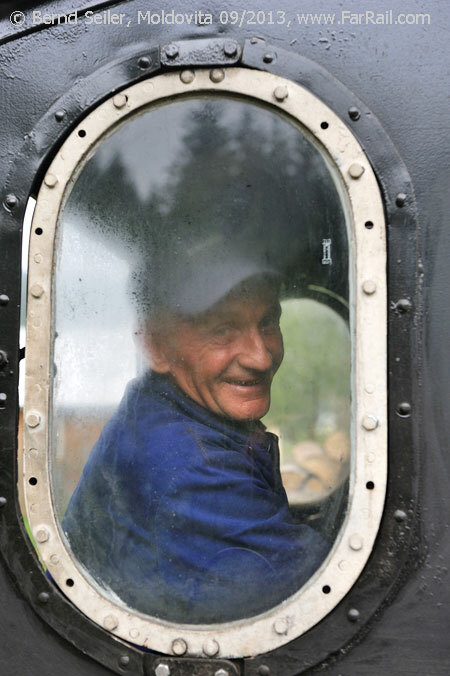 Many photo stops and run-bys are planned with our truly authentic train. About 11.30 hrs we’ll continue to Campeni, where another narrow gauge steam train is waiting for us. 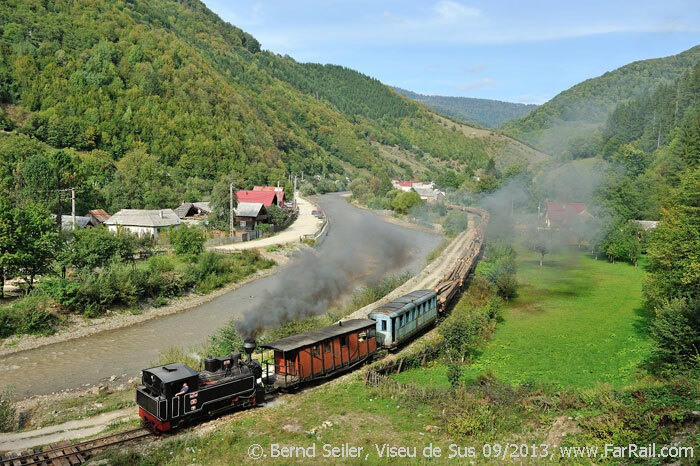 Our Budapest locomotive will haul two authentic passenger coaches and a freight wagon. We’ll go though a beautiful valley up to Abrud. In the late afternoon, when the shadows have reached the bottom of the valley we’ll go by charter bus to Cluj Napoca. Hotel in Cluj Napoca. Return flight home. The flight can be booked by FarRail Tours if needed. On this tour we’ll visit a place where logs come from. This requires some walking through the forest or recently deforested areas. At this time it is not possible to say where this will be or how far we need to walk to get to the logging site. Just be prepared for a walk of perhaps up to half a mile. 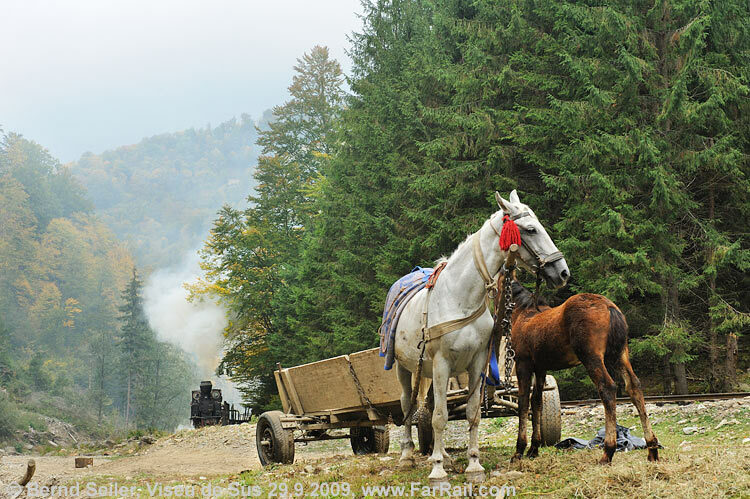 If you don’t want to see the cutting in the forest you can also wait at the railway line where the cut logs will be probably brought by horses. 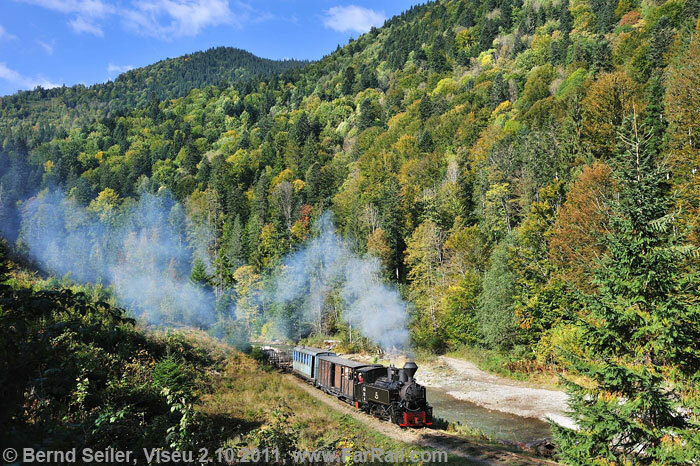 The narrow gauge forest railway of Viseu de Sus is the last remaining one in operation in Romania. Besides diesel engines, steam locomotives are still serviceable, mostly the Resita-build 0-8-0T or their Reghin-built counterparts. Besides these, two more interesting steam locomotives are in running condition. One of them is the 0-8-0 Orenstein & Koppel-built tank locomotive 764 211 and the other is 763 193, an 0-6-0 tank engine with an inside frame build by Krauss in Munich. The technical shape of the latter don’t allow to haul trains. It came to Viseu de Sus from the forest railway at Moldovita after it closed. Steam is not used on a regular basis any more but is still used for tourist trains. The main line starts in Viseu de Sus at the large sawmill and runs steadily uphill for 43 km to Coman at the Ukrainian border. There was also a branch line to the east into the Novat valley of which only a small part is still usable. Both lines offer plenty of opportunities for good pictures. On the main line there are three tunnels very close together. Not only is the landscape something special, the trains in themselves are also noteworthy. We will try to make up authentic trains, as they ran in the eighties, when the line belonged to the state run forestry railway CFF (Caile Ferate Forestiere) and when it was worked by steam locomotives exclusively. In 2014 only two conventional working passenger coaches remained in working order, both painted in a bluish green. It cannot be guaranteed that we can get one of these original coaches for our train, but we have good chances that it will work. 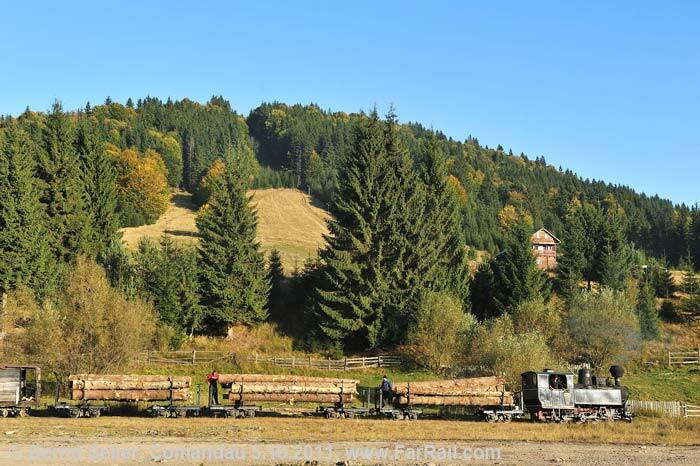 Besides locomotive, tender and passenger coach we’ll carry several empty trucks for the logs uphill to the loading points. Sometimes there are forestry tractors or other machinery that will have to be brought up into the forest. This equipment will be carried by the railway as well. We don’t have a direct influence on the train dispatching but our chances of getting an authentic train behind the locomotive are quite good on the Sunday and Monday. The next day we’ll take what’s available which has been in most cases on our previous trips, authentic as well. We’ll try to get a loaded train and bring it down to the sawmill in Viseu de Sus. However, there is a remarkable resistance to doing this and only if all the necessary people work together have we a chance to get a loaded train. It depends on the negotiation skills of our partner in Viseu. We have no real influence on the decisions of the railway. 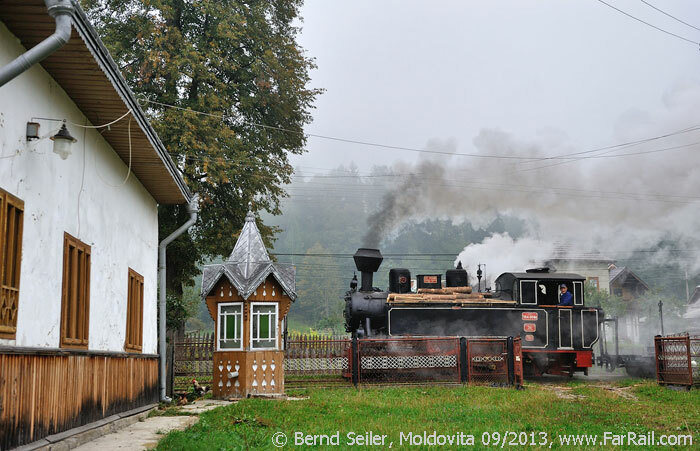 Moldovita was a really nice forestry line. 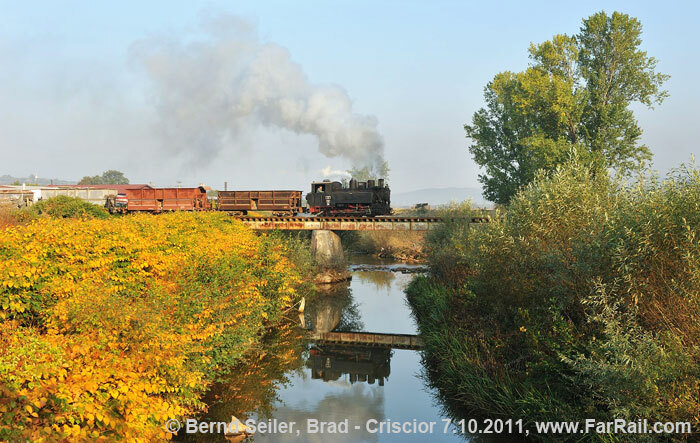 In its last years of operation they used a Resita (764 449) and the 0-6-0 inside frame 763 193 locomotive from Krauss/Munich. The small engine was not only the main attraction of the line, it also was amazing what this little, 50 hp engine was able to pull and push uphill over the steep gradients of this line. It’s a little miracle that this unique engine survived and is still serviceable (unable to haul trains, however). The forestry line was closed and abandoned under doubtful conditions. However, because of a few railway enthusiasts, in particular Georg Hocevar, the remains could be preserved, and with the help of other railway enthusiasts a part of the lower section of the line could be refurbished. The length of the line was reduced to two kilometres just before they started to save and preserve it. Now they have rebuilt the first eleven kilometres. We’ll make a visit to the depot where our loco will be fired. Along the line we’ll pass several old-style wooden houses. The parallel road has been partly paved in recent years. We want to transfer the Krauss loco 763 193 to the line, but due to political resistance this remains impossible. There are fears that it would be impossible to re-transfer the loco back to Viseu after we’ve used it for our charter train. The problem is that the city council of Viseu and Moldovita belong to different political parties  and this is still a problem in south eastern Europe. 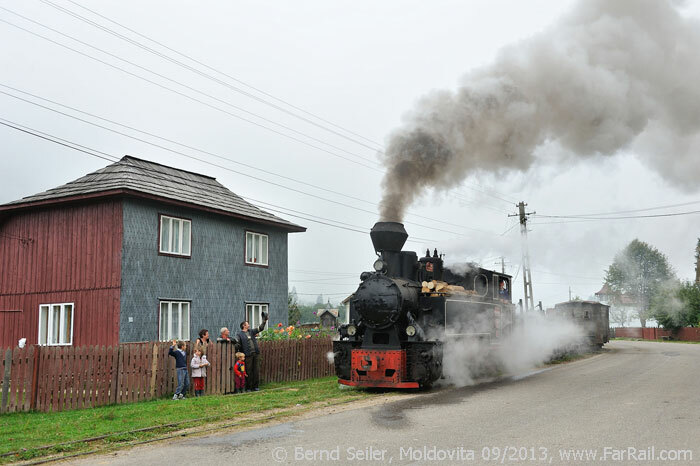 So we’ll use a Resita loco in Moldovita. Covasna and Comandau were part of a forestry line, connected by an inclined plane in Siclau. In Comandau several lines headed into the forest. One of them was used until 12 years ago. But after the sawmill in Comandau was closed, the railway lost its major contractor and was closed as well. What remains is a seven kilometre long track into the forests from Comandau (Komandó) on the way to the pass at Holomu (Halom). The line ends near the old loading point at Cumpana. In addition we’ve encouraged them (and paid for) to re-build a part of the line over a bridge near Comandau. On these sections you will find many nice positions for pictures, especially in the chilly morning air. The altitude is about 1000 metres above sea level, so there might be even a little snow in October. Close to the current terminus of the railway we’ve arranged trucks, which will load their logs on to our wagons. 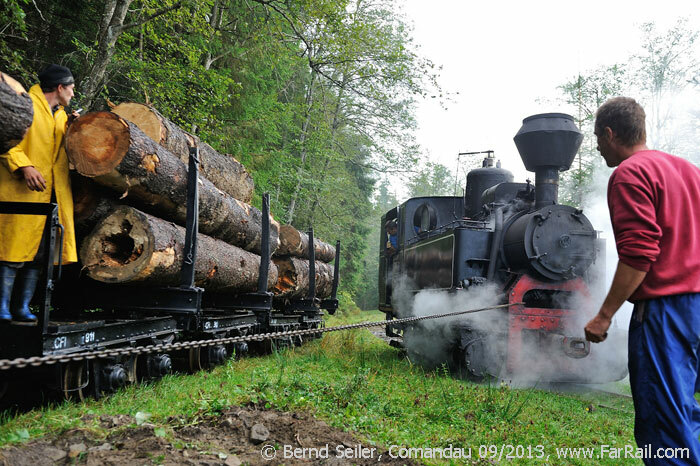 During the loading process we’ll enjoy a picnic in the forest and later return with a real logging train to Comandau. Our locomotive will probably be the Budapest-built 0-8-0 764 243. Overnight we’ll transfer our locomotive by a low-loader truck from Comandau to Covasna (Kovaszna). There we’ll use the loco on the remaining bit of the line for a short charter train with logging trucks. As we do not have a van here we’ll travel in a diesel train with fancy tourist coaches ahead of our steam train. 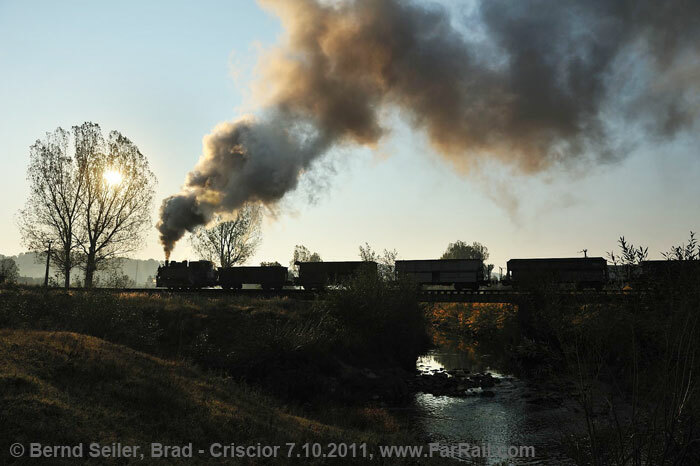 Brad  Criscior is a short industrial line from the state railway station in Brad to an industrial complex for repairing and construction of railway and mining equipment and railway vehicles in Criscior. The line leaves the state railway in a curve, passes a river bridge and follows along a small road in a populated area. In some places, a large industrial pipe runs parallel to the line, as was the situation 25 years ago. The scenery in this part is really ugly … so ugly, that it becomes photogenic again! But in the first section of the line you can make some nice countryside shots, so don’t worry too much. We formed a train out of about five coal hoppers and the local Resita locomotive. This train composition was used for many years in regular service. 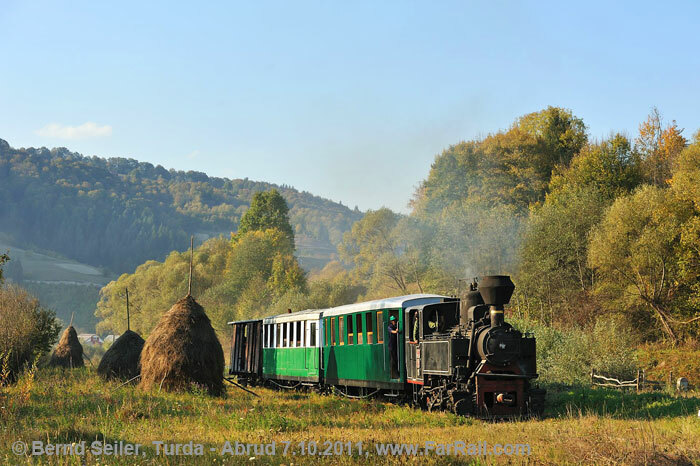 The former state railway operated narrow gauge line from Turda to Abrud is still serviceable in the short but very scenic section from Campeni to Abrud. This part of the line is surrounded by mountains. Especially photogenic are the little, rural villages along the line which haven’t changed much since 1990. 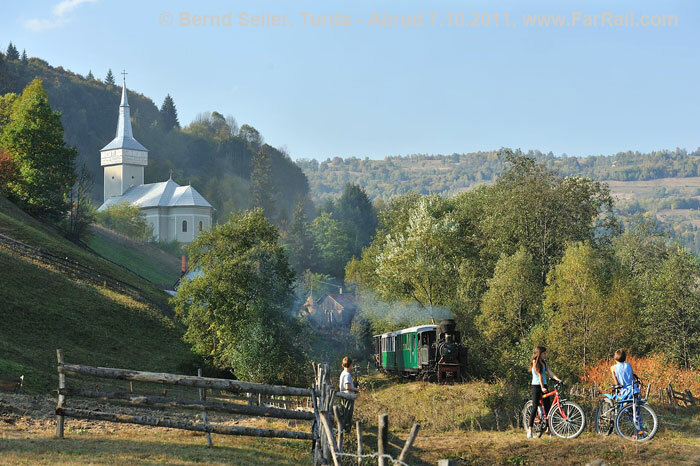 A white painted, wooden church is sitting in the valley of the railway  just perfectly placed to include it in the picture. In Autumn the locals cut the meadows to prepare food for their animals in winter. They still pile this up traditionally, so we may find some hay stacks along the line. Something like this is almost extinct in western Europe these days. 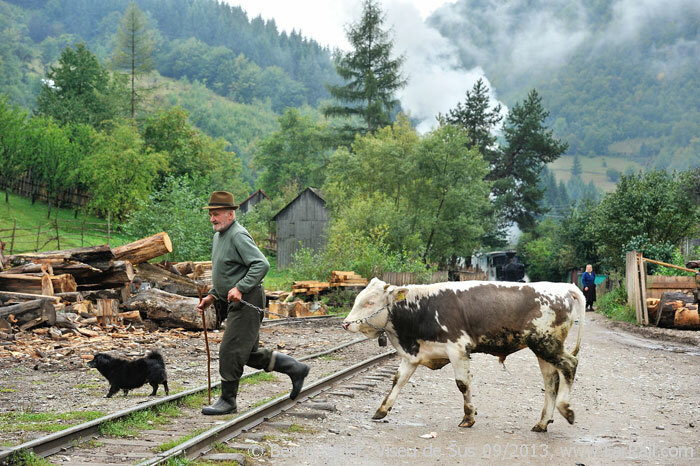 The classic Romania is  despite the light bulb ban of the European Union  still a very traditional country! Romania is a new member of the European Union. This has brought a lot of change to the country but in the small villages along the lines we can still experience the traditional Romania and its hospitality. Serious crime is almost unheard of; our accommodations are either family run or nice basic lower to middle class hotels and all offer a warm shower and reasonable, good food. The night spent in the mountains is in basic accommodation, which is quite clean with basic cold washing facilities. It’s not certain that the lavatories in the building will be operable, so we may need to use the outside lavatories. We’ll stay in big, simple rooms. There are no single or double rooms available for this night. It’s likely that this accommodation doesn’t offer electricity. Please carry sufficient spare batteries with you. The use of a specific locomotive cannot be promised on any line we’ll visit. 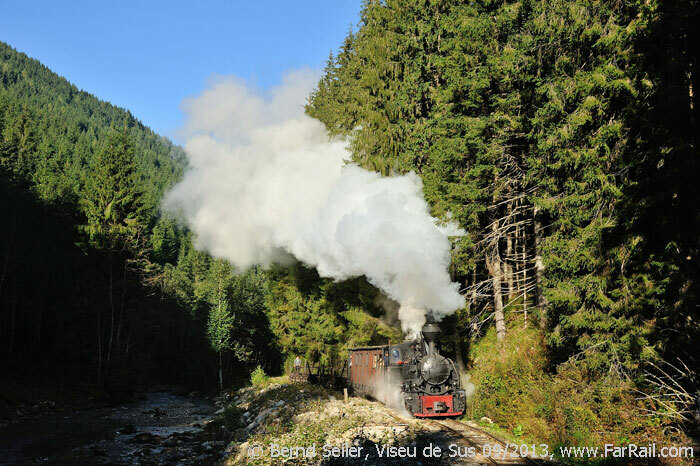 In Viseu we will use steam engines for the regular trains depending on their availability. We don’t know which steam locomotives will be operational. The engines built by Resita and Reghin seem to be almost “indestructible”, so the local workshop should be able to solve any problems. For the unique but very weak Krauss locomotive 763 193 and the Budapest in Comandau we’ve no substitutes. If one of these locos fails we can’t offer another one. Because of the high costs of bringing the locomotives to these lines there is also no refund possible if something goes wrong and steam operation can’t be delivered. On this tour we have planned several events which can’t be guaranteed in any respect. Neither the horses, nor the manual loading process, the number of wagons or a specific locomotive can be guaranteed. In our pensions and hotels there is sufficient power supplies for charging batteries. However, in our accommodation in the mountains there might be no power supply. In addition, there is no cell phone signal in the forests (luckily). Health: no problems exist concerning your health. The water from the numerous springs along the line in Viseu can be drunk without a problem, even the small streams just above the first village have clear and drinkable water. The only serious health risk is if you are not careful around an operating railway. Jumping up or down from moving trains is not allowed in Viseu de Sus. Getting on or off, and travelling on the train is at your own risk, so take care along the railway. Wear good sturdy shoes. The tour is planned with the dedicated photographer and video filmmaker in mind. The itinerary is designed for those who think it more important to get the perfect shot, not necessarily to sample the local food, bars or nightclubs. Now both passenger coaches are green. Accommodation in pensions in Viseu de Sus, in a basic guesthouse in the mountains and in simple lower to middle class hotels of Romanian standard, on the rest of the tour.